It’s hard to keep a secret these days. Things just got a lot more interesting for Progressive Music Fans and for those that value authentic classic bands with great players. Word has spread quickly that 3.2 featuring Robert Berry will indeed perform at this year’s ProgStock Festival, the annual 3-day event this October in Rahway, New Jersey. ProgStock is the gem of the Prog music festivals as it continues to feature more prestigious acts every year and has proven to be one of music’s premiere interactive events, where the artists and fans mingle and bond over more than just music. This is an event everyone will want to attend. 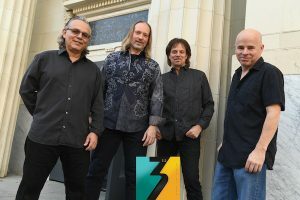 Robert Berry, riding high with his latest release, “3.2-The Rules Have Changed”, co-written with keyboardist Keith Emerson has just revealed the members in his stellar four-piece touring band. They’re set to begin performing soon. Those who appreciate the artistry of YES, ELP, Keith Emerson, Genesis, Jethro Tull, and the like are in for a real treat. Berry is renowned for his bass and vocal work, as a multi-instrumentalist, and for writing and touring with Emerson, Carl Palmer, Steve Howe (Yes), GTR, and Ambrosia, to name but a few. 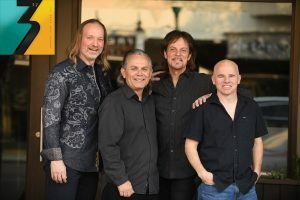 Rounding out the new touring group are drummer Jimmy Keegan (Spock’s Beard), guitarist Paul Keller (Emerson/Palmer), and keyboardist Andrew Colyer (Circuline, Cell15). In addition to the instrumental heavy lifting, all four band members sing – a rarity in the world of Prog. Berry, Keegan, Keller and Colyer began live rehearsals in November 2018, and are looking forward to not only performing Keith Emerson’s great final work, but will also be pulling from Berry’s 30-year catalogue of Progressive Rock. Additionally, the sets will draw from Berry’s work with Steve Howe, Ambrosia, his solo efforts, and his critically acclaimed songs from various Magna Carta tribute albums which feature the music of YES, ELP, Genesis, and Jethro Tull. Robert Berry is an American musician, songwriter, and producer. He’s co-written with Steve Howe for the band GTR, and is a former Ambrosia band member. He earned international acclaim for his powerful version of the Yes’s “Roundabout” for Magna Carta, drawing some to anoint him as a “crafty American version of Trevor Rabin”, an honor Berry seems too humble to talk about. Berry and Keith Emerson formed “3” in the 1980’s along with Carl Palmer, and had the #9 Billboard hit “Talkin’ Bout”. Their debut album “To The Power of 3” on Geffen – a label known at the time for their stable of notable artists such as Peter Gabriel, charted respectably. In 2015, a Boston radio station unearthed tapes from the 1988 “3” tour, and released them as a live album. After hearing that impressive live performance, Emerson was inspired to reunite with Berry, and the pair resumed work on the unfinished “3” follow up album. Then, with Emerson’s tragic passing in 2016, it appeared the new album might be lost, but Berry persevered. In the spring of 2018, with the blessing of the Emerson Estate, Berry and Frontiers Music released the long awaited new record. The first official pre-release single, “Somebody’s Watching”, unleased in May, sparked impressive pre-orders on Amazon. That initial excitement generated 7,000 YouTube views in the first 36 hours, surged to over 12,000 views in the first week and continues to grow. A musical phoenix had indeed risen. The album was released on August 10, 2018, and hit #1 on Amazon, selling out on the first day, and placed in the top tier on two Billboard charts. A pair of videos from the album have over 64,000 cumulative views on YouTube. The new album has met with unanimous positive acclaim internationally, from over 100 magazine articles, blog and website reviews, and FM and internet radio stations interviews. What if Robert Berry was in YES today, and they were just now writing Roundabout? How would that sound? We got the answer when Berry re-envisioned and re-arranged the song for the Tales From Yesterday album, and it was wickedly fantastic! His series of classic Prog re-workings for Magna Carta Records not only won him international acclaim, but earned him praise from the creators of those songs. Jethro Tull’s Ian Anderson reached out with a gracious personal letter expressing how much he enjoyed Berry’s re-working of “Minstrel in the Gallery”. Berry’s friend Steve Howe wrote that he quite liked the new recording of Yes’s “Roundabout”, saying that the new bass line “kicks the original all about”. Howe even played acoustic guitar on Berry’s new version. “Watcher of The Skies” (Genesis) is about as quintessential Prog as anything. To many it’s the Holy Grail of the genre, so it’s hard to imagine anyone even daring to alter it — yet the new Berry version is heavier and deeper in many ways. For Emerson, Lake & Palmer’s “Karn Evil #9”, he pays tribute to his mates Keith Emerson and Carl Palmer, by calling on Dream Theater’s Jordan Rudess for Keyboards, along with Drummer Simon Phillips, and Violinist Mark Wood. And let’s not forget Berry was a former member of Ambrosia, and he gives us a heavier and punchier version of their classic “Life Beyond L.A.” His unmistakable Vocals, Bass and Guitar form a clear sonic trademark on all five of these re-envisioned songs – they really are astounding — and they will all be performed in the band’s new live show as well. 3.2 featuring Robert Berry Live is More Than Just a Concert – It’s An Event: With his 30 year history of playing side-by-side with many of Prog and Rock music’s elite, Berry has a deep well of enlightening tales to share and his warm personality, spontaneity and approach allow him to appeal to fans of many musical genres. More than just a concert, these shows will have the songs and the road stories and recollections behind those storied songs.